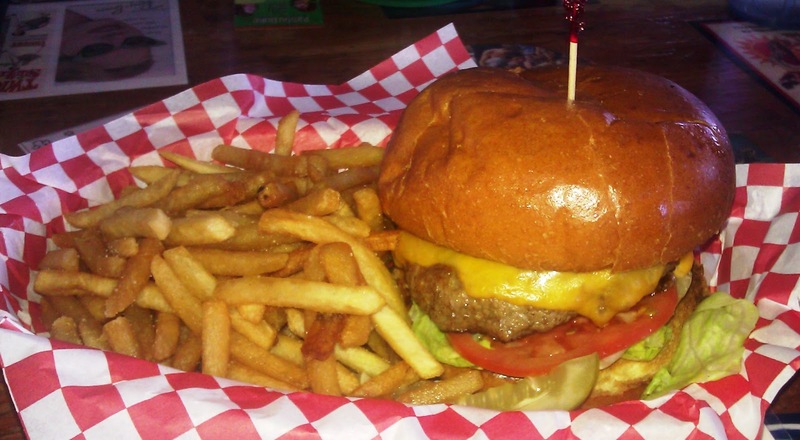 The Las Vegas Review Journal pronounced Rambo's Kitchen as serving one of the best burgers in the area. Happy Meal and I decided to put that to the test. As luck would have it, The Marinater was on his way out of town, so we made the short trek from the touristy part of Las Vegas to the outskirts where Rambo's Kitchen was located. The temperature was 111 degree outside, and Happy Meal did not approve. 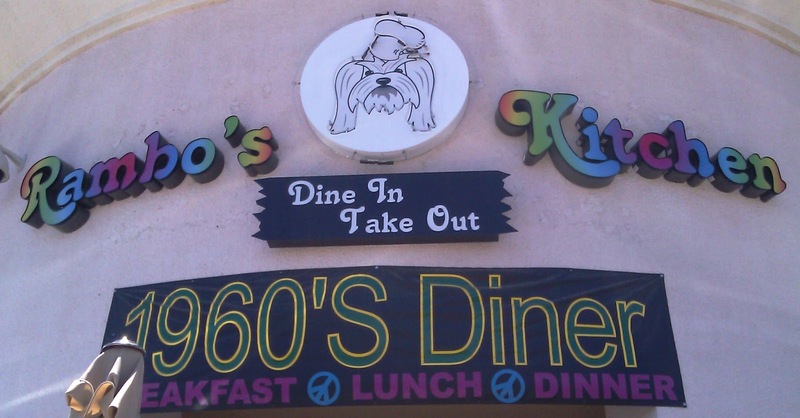 Rambo's Kitchen looks a lot like the 60s and 70s just threw up on it. The service was a throwback, as well. Throwback---more like thrown out...the service was abhorrent. I had to track down our server no less than three times. I digress. Parking was free in the strip mall lot where the anachronistic establishment was situated. We were seated quickly. We ordered a variety of cheeseburgers and settled in for a 15-minute wait. The Beef: Meh. The burgers at Rambo's Kitchen were 100% Chuck. In the case of our meals, the Chuck was over-cooked, bland, and rubbery. The beef was likely previously frozen. The grind was fine, and that rarely bodes well. Finely ground beef speaks to too much connective tissue. It also creates too much surface area where new protein bonds form and create a chewy bite. The flavor was mildly beefy........and that was it. The burgers were a little dry, and the fat content was at about 20%. The Seasoning: There was no seasoning. The cheeseburgers at Rambo's Kitchen would have benefited from some seasoning. The Preparation: The burgers were consistently over-cooked/steamed on a gas-fired flat top. The staff cooked the burger patties under domes. This caused the thinner burger patties to steam rather than fry. The burgers were formed during morning prep. The beef arrived pre-ground. My burger, The Cheesy Cheese Burger was stuffed with cheese, since this was the award-winning burger. Rather than being good, it was simply really cheesy. I gave most of it to The Marinater and Happy Meal. My burger was the most palatable of the lot. My burger had a bit of pink due its thickness. 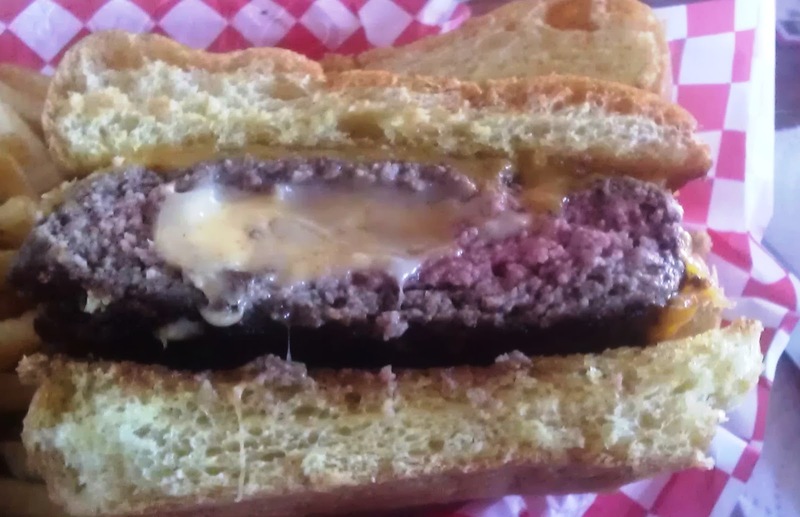 The Cheese: The cheese was properly melted, but it didn't stand up to the overly sweet bun or the over-cooked, rubbery beef. The Bun: The bun was really nicely toasted and crisp, and it delivered a satisfying crunch to each bite. Sadly,the bun was overly sweet, and this was a major distraction. 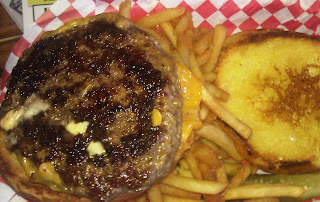 The Meat To Bun Ration: The soft, fresh bun would have been a better match to a moist and properly cooked burger patty. The Toppings: The Iceberg lettuce and tomato were both ripe and fresh. The Fries: The fries were properly seasoned, but they were cooked to the point of translucency. Beyond that, the fries were more like fry bits. They averaged about 1/2 inch long--that was a little offputting. It seemed like we were getting whatever was left after the end of a long rush. The fries at Rambo's Kitchen were properly seasoned. The Value: My Cheese Burger was $11.49, and that was way too much for over-cooked Chuck, vulcanized fries, and piss poor service. The value at Rambo's Kitchen was exceedingly weak. While the service was lousy at Rambo's Kitchen, the real issue was that the cheeseburgers were equally lousy. Maybe they were having a bad day, but I review them on the day that I am there. Happy Meal does not endorse patronizing this establishment. Burger Review : The incompetently prepared burgers were a perfect match to the incompetent service.